For the last six months or so, I have been writing in and exploring around Mastodon, a federated social networking space that is free from corporate structure. Federated means there is no one central server or space where people are located. Instead, there are “instances” where people connect to and write from (instances are hosted by individuals and most instances have a theme). All instances can share across the larger Mastodon network. I know that will sound confusing. Upshot for me: it’s becoming a neat, creative, connected space that is more than just an alternative to Twitter. In late September, someone in the Mastodon timeline put out a call for musicians to collaborate together for an album project. They hoped to leverage the connected element of common interests into a music project. 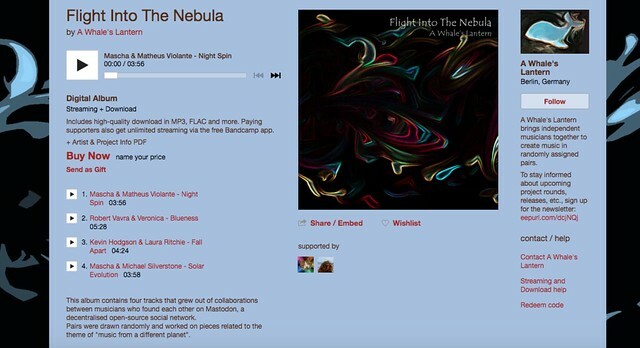 I took the plunge, and became part of what is now known as A Whale’s Lantern project — a collaboration of musicians who have made music through the Mastodon network. While I didn’t know who I would be partnered with, as names were drawn randomly, it turns out I was paired with a friend from other connected spaces: Laura Ritchie. She’s a cellist and music teacher and wide-range thinker. Yesterday, our “album” was released on Bandcamp. Laura and I worked on a song that I wrote called I Fall Apart (Like Stars in the Night) and the whole group of us, including some of who didn’t get time to finish their collaboration, are in the midst of writing up our reflections. Collaboratively, of course, and hopefully, it will be published in a Mastodon open journal called Kintsugi in the future. Check out A Whale’s Lantern: Flight into the Nebula. Google and Sound Exploder (a cool podcast in which musicians dig deeper into their tracks) have created a pretty interesting new music experience called Inside Music. Only a few tracks are available right now, but the website brings you into an immersive 360 degree environment with all the tracks of the songs separated out, so you can isolate tracks and remix different elements of songs. They have also put the code out for GitHub, as they invite other musicians and others to replicate the experience with their own songs and own tracks. I don’t know how to do that, but it would be fascinating to try it out with an original song some day. Note: in my Chrome browser on my laptop, the site didn’t launch right. It might be because of some of my ad blocking or maybe some other settings. I’m not sure. In Safari and Firefox, though, it all worked fine and was very cool. And I want to try it out on my phone, maybe with Google Cardboard. I spent part of the other morning re-reading a comic book from Duke University that resonates with my own interests around music, composition and remix. Entitled Theft: A History of Music, the book explores copyright law and music composition through the ages. If that sounds boring, it isn’t. The book weaves in lots of humor and visual creativity as it shows the path of “borrowing” other people’s music for remix over time. What’s great is the book is free for download, or for reading online. You can also purchase a copy, but the intent of the university’s Center for the Study of Public Domain is to educate the public, so the book is free for educational purposes. What becomes clear pretty quickly is how much we always have borrowed from each other, and how legal codes over time have moved to protect the original artists even as those codes tried to balance the possibilities of moving art in new directions. This is the conundrum of the current musical scene, where hip hop artists build new songs out of samples of old songs. Or used to. Now, it costs a lot of money to do that, with lawyers jumping all over the samples. This is not necessarily a bad thing — it is forcing rappers and others to hire musicians who can play instruments (listen to Kendrick Lamar) or learning themselves how to play (listen to D’Angelo) so that they are making all of the music. But that has changed the nature of hip-hop, too. It’s all very intriguing, I think. I appreciated this history lessons here and I need to come back to Theft for a second, deeper read. I think I need to get it into my Kindle for a better reading experience, though. The book may not be good for my classroom — the vocabulary and concepts are beyond the sixth grade — but I can see pulling out some pages for times when we talk about digital writing and remix in the classroom, and how the current music scene is just a glimpse of the debate that has been raging since Plato’s time (he argued against remix). Sometimes, I get obsessed with a song I am writing. It follows me everywhere. At night, I’ll wake up, hearing the chord changes and then I’ll be tweaking the lyrics as I try to fall back asleep. Someone will be talking to me during the day, and I’ll realize I was somewhere else in my head, lost in the song’s architecture. I’ll juggle words, phrases, verses. Add a bridge, then remove it. I’m not suggesting I am writing musical classics, or that anyone other than me will like the music I am engaged in. I know my limits and limitations. But there is something in the creative endeavor of merging music and words and message together in a song that exerts an awfully powerful pull on me. If you listen and get something out of it, I am happy. 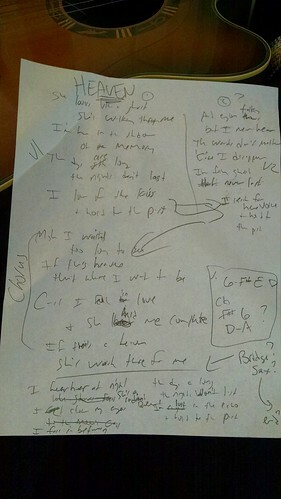 The other day, I started to write this new song — Heaven (Where I Want To Be) — and I could not shake it loose. In fact, I had the chorus nearly immediately, almost as soon as I started strumming, yet the lyrics to the verses were frustrating me. I worked and reworked them, over and over. I almost tossed the whole thing out a few times. It kept pulling me back to the guitar. The song is inspired by two things. First, an elderly couple in our neighborhood suffered a recent loss when one of them passed away. Another elderly couple nearby might be nearing that situation, too. An ambulance was at the door this week. These are neighbors who were married for decades. I started thinking of what happens when you lose someone after so long. Second, I’ve been listening a lot to this Jason Isbell song — If We Were Vampires — which is about that same theme, about the realization that one of the two of lovers in life will someday leave this place first, and the other lover will have to find a way to forge ahead, alone. The narrator in my Heaven song is in that situation, too, remembering the traces of a lifetime together and skirting the boundaries between reality and remembering, of ghosts and love. What is real, anyway?